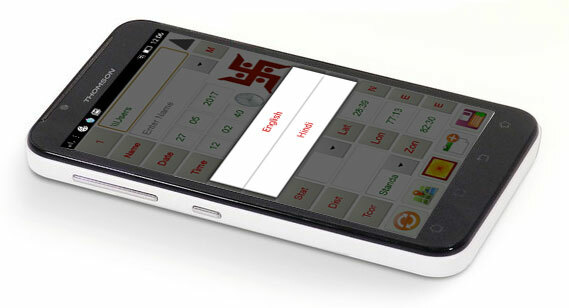 LEOTOUCH meant for android based mobiles is a Janampatri software based primarily on Parashari however Jaimini, Lal Kitab, KP and Horary astrology has also been incorporated in it. 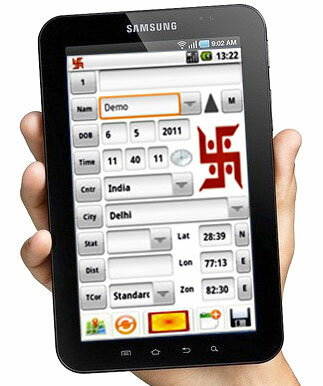 This Kundli software LEOTOUCH is available in Hindi and English. LeoTouch horoscope software contains all aspects of astrology with comprehensive Calculations, Remedies, Predictions, Various Vedic Charts, Teva, Dashas, Matching, Varshphal, Numerology, Horary, K.P, Lal Kitab, Muhurat, Panchang, Mundane, Books, Calendar, Transit, Mantras and lots of other useful information. This Indian astrology software is also available in a Home Version (for students and home users) and Modules (all packages separately). In this Vedic software several horoscopes can be viewed and matched simultaneously on one single screen. Different Varshphal, KP calculations and Muhurats can be viewed and used simultaneously. LeoTouch kundali software has its own data bank containing birth details of thousands of celebrities which can be used for research and comparative study. Now Future Point is presenting to you the ultimate astrology software for android mobile phones/Tabs. Its market value lies in its credibility and accuracy. LeoTouch horoscope software is accepted by astrologers all over the world with great appreciation. It really helps them to get most accurate calculation by just a click and saves their time. Price analysis, Transit of Planets, Result of Transit. In the horoscope made by LeoTouch not only the position of planets in houses can be analyzed rather the birth chart, Chalit chart, Dasha, Sarvashtak chart, Shadbal, Avakhada and various other charts used in making astrological predictions can be studied. This software has its own data bank containing birth details of thousands of celebrities which can be used for research and comparative study. In this Kundli software several horoscopes can be viewed and matched simultaneously. Different Varshphal, KP calculations and Muhurats can be viewed and used simultaneously. This horoscope software is based primarily on Parashari however Jaimini, Lal Kitab, KP and Horary astrology has also been incorporated in it. This horoscope software contains all aspects of astrology with comprehensive Calculations, Remedies, Prediction, Various Charts, Dashas, Matching, Varshphal, Numerology, Horary, K.P, Lal Kitab, Muhurat, Panchang, Mundane, Books, Calendar, Transit, Mantras and lots of other useful information. Available in Hindi and English with modules Astrology, Matching, Varshphal, Numerology, Horary, K.P, Lal Kitab, Muhurat, Panchang, Transit etc. It is also available in a Home Version (for students and home users) and Modules (all packages separately). Exhaustive Computations of Horoscope, Varshphal, Matching, Horary Analysis, Lal Kitab, Numerology, Muhurat, Lal Kitab, KP System and Panchang. Checkout why astrologers prefer LeoTouch? A very frequent question being asked in office or phone is which software one should buy. Should they go for desk top or Laptop based software Leo Star or Android based Leo Touch. Software is the same in both so the buyer gets confused many times when he has to select one. Well, with my experience I would like to place my opinion for your selection. For those who are stationed in one office from ten to six and have their own commercial shop for astrology then of course Leo Star is good for taking detailed printout and seeing the horoscope for consultancy on lap top or desk top. In metro cities where life is mobile, people are spending two to three hours on road it is really difficult to carry your lap top always with you, here comes Leo Touch in the picture. Everyone is carrying a phone in their pocket and LeoTouch is there to solve your queries whether you are in car, facing traffic jam, in train or plane or in a function, you can be the centre of attraction by displaying your smart phone with latest astrological software Leo Touch. Whether it’s general horoscope, matching, numerology report or lal kitab remedies, you can quench the thirst of questions any time anywhere for any birth place in few minutes. Sometimes when people don’t have birth details you can show heroic deeds by replying through Prashana phal. It comes out to be very accurate at times. For knowing the auspicious time for activities like purchase of new car, Grih Pravesh, Marriage or Mundan ceremony of children, Panchang muhurta is there for your convenience. In your free or travelling time, you can learn and update your knowledge by going through so many tables which are self explanatory and very easy to learn the basics. For maintaining a list of clients you can store all birth details familywise. You can also play so many mantras to reduce the negative energy and get the benefits of mantra as per your choice or requirement. In fact mantra can be played 108 times to get positive vibes. One can also see the current movement of planets to give daily prediction. All this is possible not only on Android based phone but also on Tab which has a bigger screen. Even print out can be taken by attaching your phone to a computer or laptop. In this age of Internet, PDF file can be sent by mail. So just by a soft touch of yours the entire world of astrology is before you. Its price is also half the price of best desktop astrology software Leostar. So why not opt for it. Whether one is amateur, learner or a professional astrologer it is the best for all. We are sure you can't resist yourself any more to order for the same. Leo Touch program today typically make accurate planetary positions, calculations, display and print these positions, save and retrieve individuals' data to and from database files, compare the planetary positions of different charts to find the astrological aspects between them (e.g. for compatibility), calculate the dates of important events in the future for a chart, and re-search the saved chart database. Leo Touch has atlas, allowing the review of the longitudes, latitudes and time zone observance. Leo Touch also assembles interpretive text about the various element combinations in a chart into comprehensive printed reports. But for that it shall be essential to make the PDF file of the desired material. LeoTouch comes in all major Indian languages. LeoTouch is available in Hindi, English and shortly it shall be available in other languages like Gujrati, Marathi, Oriya, Bangla, Assami, Telugu, Panjabi and Nepali. For each topic (Dasha, horoscope, prediction) the language can be changed as per your choice.